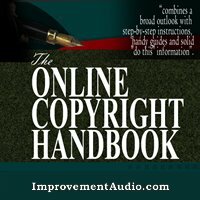 Online Copyright Handbook - Guide To Online Copyright Law. Download mp3 audiobook. Excerpt from Section One : Do you need to publish? The terms "plagiarism" and "copyright violation" are often used interchangeably. Although that may work well for most dinner table conversations, it's actually incredibly incorrect. Not all acts of plagiarism are copyright violations and the two concepts are actually quite distinct. Copyright violation refers to the use of protected material without the appropriately expressed consent of the owner. If you take a poem I have written and to which I hold copyright and then place it on your website, you are violating my copyright. You are breaking the law. Are you plagiarizing? Maybe. If you indicate that I am the author (attribution) you aren't really plagiarizing. You have certainly stolen my poem and you are in violation of copyright law, but you aren't passing it off as your own. Plagiarism refers to stealing the work or ideas of another person for your own use without properly attributing the source. Being a plagiarist can get you in trouble in academic and professional settings, but it isn't necessarily illegal. Illegality only enters the picture at the point of a copyright violation. Plagiarism is, primarily, an ethical issue. It involves whether it is right or wrong to copy or to steal the ideas of another and pretend as if it is your own. Copyright, on the other hand, is a legal matter. It involves whether your use of someone else's work infringes their intellectual property rights. All copyright violations aren't plagiarism. Not all plagiarism rises to the level of copyright violation. However, the two phenomena do overlap a great deal. In many cases, the plagiarist will be a copyright infringer. Quite often, the person violating a copyright will be in the process of plagiarizing. Nonetheless, it does make sense to understand the difference between the two acts. If someone plagiarizes you, you may or may not have recourse. It will usually depend upon whether the act also constitutes an infringement of copyright.